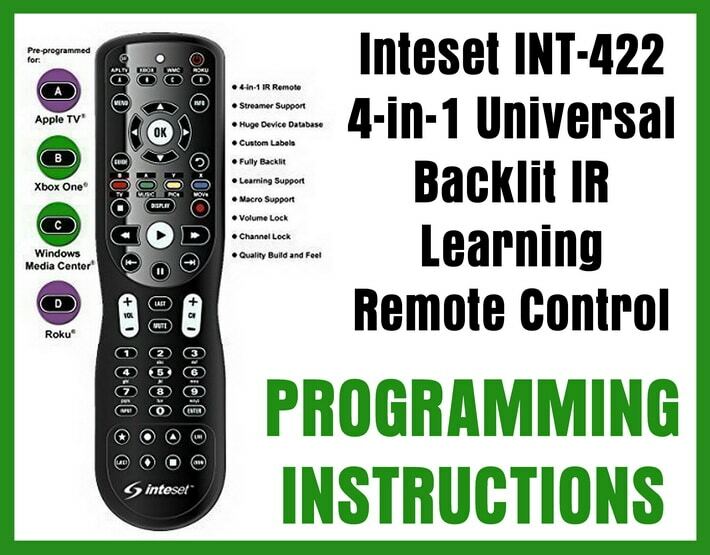 Inteset INT-422 4-in-1 Universal Backlit IR Learning Remote Control Programming. 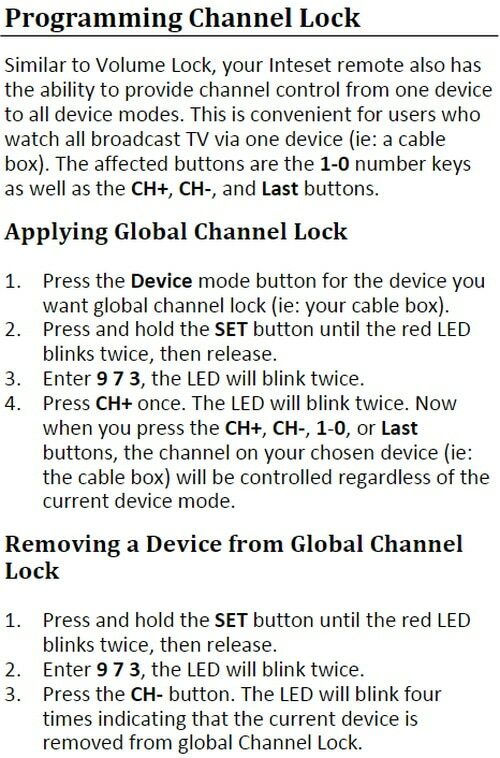 If you need to program your Inteset Universal Remote, the easiest way is shown below. Remember this remote control is already preprogrammed to work with Apple TV, Xbox One, Windows Media Center system, and Roku. So if you have one of those devices, there is no need to program the remote. 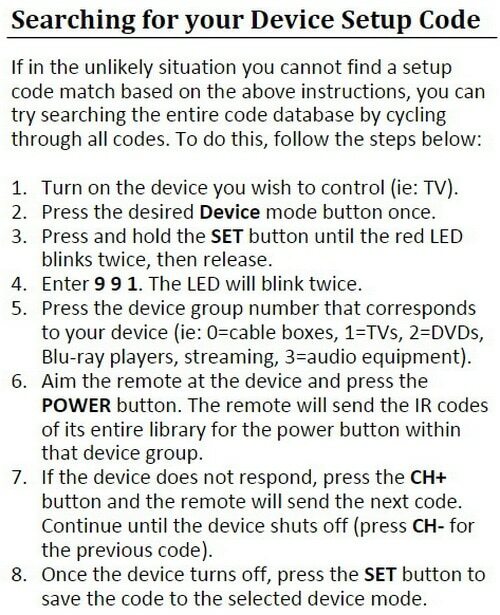 If you are trying to program it to work with your TV, DVD, BLU-RAY, or other device, see below. Before programming your Inteset remote control, first find the remote control setup codes for the audio and video devices you will be adding. You can find these codes by searching for remote codes here and searching for your component name in the top right box. 3 – Press and hold the SET button on the remote until the red signal LED light blinks twice, then release the button. 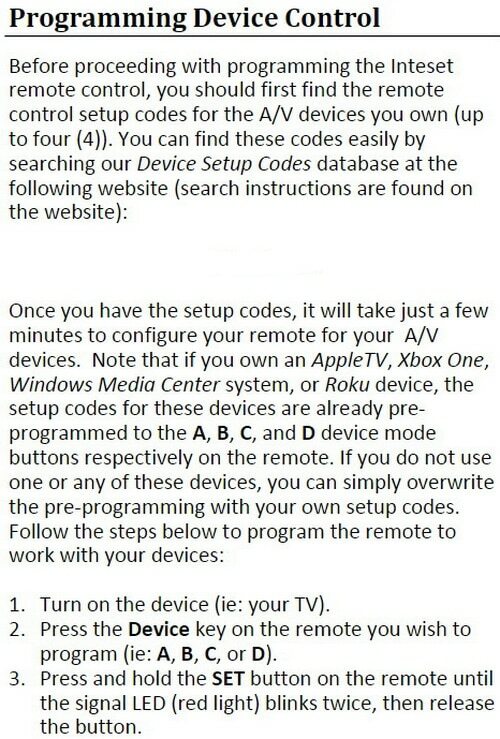 4 – Enter the first setup code for the device (TV – DVD – BLU-RAY – ETC) from the database search. The LED blinks once as each digit is entered. If the code is valid, the LED will blink twice quickly. NOTE: If the LED does not blink 2 times after entering the code then repeat steps 2-4. 5 – Point the remote at the device (TV – DVD – BLU-RAY – ETC) and press the remote POWER button. The device should turn off. If it does not, repeat steps 3-5 and try each code for your component until you find one that works. 6 – Repeat steps 1-5 for the other devices you want to control. Note: If you own an AppleTV, Xbox One, Windows Media Center System, or Roku device, the setup codes for these devices are pre-programmed to the A, B, C, and D device mode buttons on the remote. If you do not use one or any of these devices, you can overwrite the pre-programming with your own setup codes. 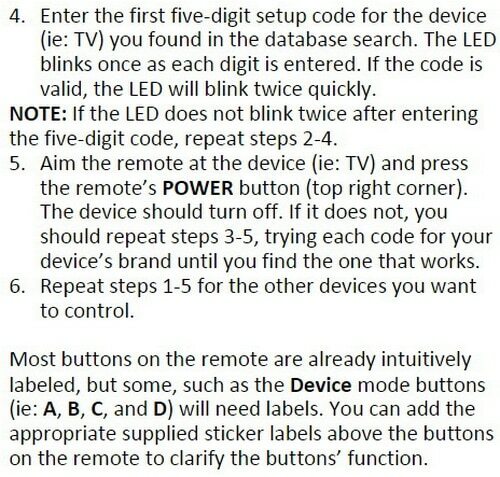 Need help with programming your Inteset Universal Remote Control? Leave your question below and we will be able to assist.